Many German cities like Frankfurt, Leipzig or Cologne have huge, purpose built exhibition halls for trade fairs or shows that are held regularly like the Book Fair in Frankfurt. In Cologne the RDA Workshop ‘only’ occupied two floors of one of the halls, but we entered via another, up imposing steps then over shiny granite floors through empty enormous spaces out into courtyards. Finally we reached the RDA building, completed the formalities and suitably identified with badges, descended onto the floor. The giant space before us was filled with a multitude of stands, information leaflets by the million and, this being Germany lots of people in Tracht (traditional dress - Lederhosen and Dirndls were favourite). He who hesitates in a trade fair ends up with aching feet and armfuls of irrelevant bumf, so we pushed on, heads up to find the Romantic Road stand first. Our cycling guide to this route from Würzburg to Füssen is being updated and revised (see www.bergstrassebikebooks.com for details) so we were anxious to check in with Jürgen Wünschenmeyer, the CEO of the Touristik-Arbeitsgemeinschaft-Romantische Strasse to hear how signposting of a few minor route changes was progressing. A mixed message, some good some bad news, which is not unusual with individual towns being responsible for local stretches. Some eMails and letters have since been fired off to encourage action. However, working nearby were staff from both Rothenburg ob der Tauber and Augsburg, both stopping points along the approximately 450 km Romantic Road cycle route. One of our latest ventures is to whet potential cyclists’ appetites by publicising the many networks of local and regional cycleways around the towns between Würzburg and Füssen. Some of these are easy to find on the web and are partly or wholly in English. Others are obscure. Knowing that cyclists could spend a few days exploring well-signposted routes from a base in Augsburg or the Pfaffenwinkel villages we think may appeal to those who don’t want to pack up and move on each day. The Rothenburg odT connection had to admit that they were working on the idea, possibly for next year, whilst the Augsburg folks have promised us some more definite information. Within 30 minutes our meetings had achieved results that would have taken far longer with phone, fax or internet. 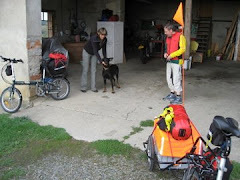 Now we had time and interest in making a few more connections and discoveries about cycling possibilities in other parts of Europe. Our feet were still fresh and fragrant, our rucksacks ready to gobble maps and cycling information.